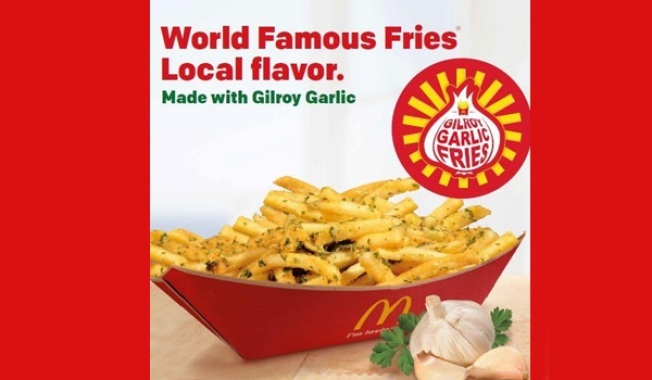 Gilroy’s world famous garlic fries are coming to the Golden Arches. We taste tested McDonald's new Gilroy Garlic Fries, which debuted at 240 Bay Area locations this week. The regional rollout was timed for the Gilroy Garlic Festival; the 38th edition began Friday and continues through Sunday. McDonald's uses garlic from the family-owned Christopher Ranch in Gilroy. A formal review would have incorporated at least one more visit to try the item (which cost 69 cents more than the plain salted fries), but the first impression on a casual taste test is that they're cheesy. They're cheesier than they are garlicky, though the subtle hang-on of the bulb might make you want to consider brushing your teeth afterwards. Bay Area palates can probably tolerate more garlic and less cheese in general, though. The biggest issue in our taste test was crispiness; the garlic topping, which also includes parmesan, parsley, salt and olive oil, has an immediate affect on the texture of the fries. They quickly become soggier than average, which left us jonesing for the usually reliably crisp fry that keeps millions addicted. That could be avoided by serving the garlic topping on the side, but it then becomes a less convenient item for some customers. It might need a little work to nail the texture, especially since they're fried in oil and then topped with a sauce containing more oil, but it's still encouraging to see an idea that supports regional farmers.